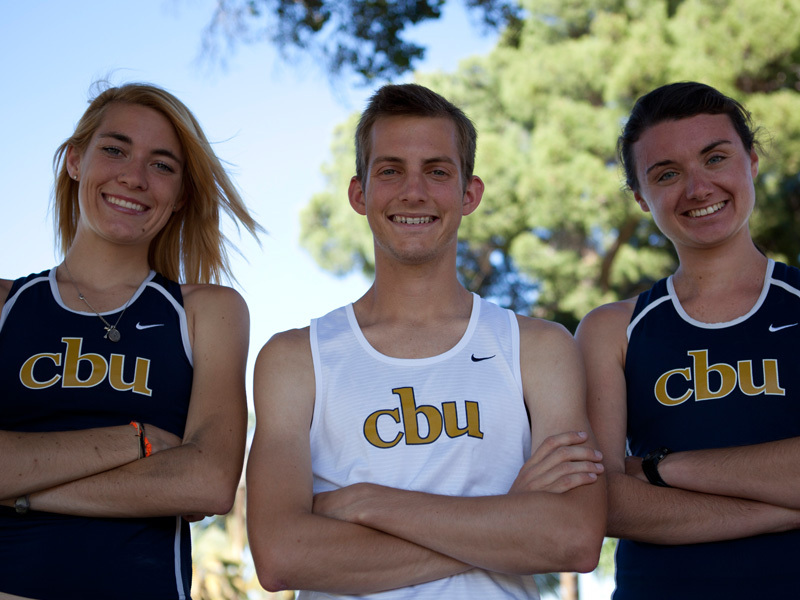 Jacob Armstrong -- Naomi Van Setten, Mark Langworthy and Jacquie Lutz are leaving their footprints on the track. Eat, study, run, sleep and repeat are the daily habits of a Lancer track athlete. Not only do they strive to achieve academic excellence, they accomplish wins and personal records on the track. The 2012 track season, thus far, has consisted of local races in southern California including the Titan Twilight Invitational in Fullerton, Pamona-Pitzer in Pomona and the Cal/Nevada State Championships in Claremont. While attending these meets, numerous outstanding track stars have broken personal records and have replaced old school records with new ones. Naomi Van Setten took fourth in the 3000-meter steeple chase at the Cal/Nevada State Championships with a time of 11 minutes and 08 seconds. She broke the school record while breaking her own record in the same race. “I broke the school record for the 3000-meter steeple chase while making a new PR in the last two races I have ran,” Van Setten, sophomore, said. Other athletes who have also been very successful this season include Mark Langworthy and Jacquie Lutz. Langworthy recalls his best race this season was at the Westmont Sunshine Invitational in Westmont. Jacquie Lutz, senior, broke the school record when she competed in the 5000-meter race at the Cal/Nevada State Championships with a new record time of 17:59, breaking the old record by 10 seconds. Langworthy has a high standard for staying positive in order to break his PRs. “Sometimes it’s tough to keep in the race mentally because it’s tough to shake off the bad races,” Langworthy said. He also added that it is important to stay positive and keep out negative thoughts. A way Langworthy stays positive is by enjoying his runs, especially easy runs, because it helps him get loose and mentally prepare for the next race. Lutz experiences a sense of fulfillment and excitement when she gets PRs. “I experience feelings of joy, peace, accomplishment, confidence and honor,” Lutz said. Van Setten also said during her race she does not think entirely about her goal time because her kick helps her pass the competition. “Thinking positively, staying motivated and having confidence in the gift of running that God has given me helps me break PRs,” Lutz said. She also likes to work on injury prevention by strengthening her core with abdominal workouts. Langworthy has a similar approach. “When I know I am going to PR, I feel really good because I know it’s me racing against the clock,” he said. He mentioned he does not worry about his competition and stays focused with his race and the way he is running. “Immediately I won’t see results, usually it will happen within a month from when I started,” Langworthy said.